Привет! And welcome to episode 28 of Russian Made Easy. Let’s start by repeating these two words. Repeat that phrase after the speaker. Try to envision Vadim handing a beer to John. Again, repeat that phrase after the speaker. Try to envision Svetlana handing a telephone to Steve. Vadim gave John a beer. Or, Svetlana gave Steve a telephone. I gave a pen to Mark. And let me talk again about word order in Russian. This phrasing: Я дал ручку Марку…. …he’s emphasizing that it was a PEN that he gave Mark, and not something else. So, the meaning is the same, but the emphasis is different. Do you remember how to say: I like pizza. To me is pleasing pizza. Olga gave the computer to me. Olga gave to me a computer. Do you like raw pig fat? Pavel gave you a car? Lit: Pavel gave to you a car? He gave you a computer? Lit” He gave to you a computer? Are you seeing, by the way, how important it was for us to have learned the super-literal version of every word and phrase? It really helps us to think in Russian. I gave the cat to Olga. What’s the ending we use for female recipients? Well, great question and I’m glad you asked. See if you can pick it out. Mom gave Anya a souvenir. I gave to Dasha your computer. Я дал Даше твой компьютер. Remember, we do these tips after we’ve learned new material because it’s a way of not thinking about the stuff you just learned. You take a little break and then try to recall what you just learned. That’s the tip I explained in the very first podcast of this series, as a way of quickly developing your long term memory. And speaking about this series…I’m going to have to put it on hold after Podcast 30. I’ve been asked to consult on the creation of some other language courses and it’s a great opportunity for me to get these new methods out there for others to use. 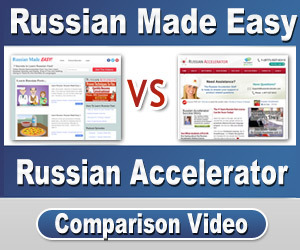 If you’ve come this far, though, it means you’re really committed to learning Russian, so I hope to see you over at my online course, Russian Accelerator. And although it’s only thirty episodes long, you nevertheless accomplished two hugley important things in Russian: You’ve learned all six verb conjugations (the sixth one is coming in the next episode) and you’ve learned all six grammatical cases. You may not know the official terms yet…the cases have fancy names like nominative case and instrumental case…but you know the endings. You know what they mean and how they work. That’s the killer part. Those two things — verb conjugations and case endings — make up the bulk of Russian grammar, and you have them pretty darn solid by now. That’s a hell of an accomplishment. In the next episode, we’ll go through them all, but for now I just wanted to congratulate you. So what’s the tip? Well, it’s simple: Keep it up! If you keep practicing the way I’ve shown you, you really can become a fluent, conversational Russian speaker. Who gave you a car? We use the masculine form of the verb when asking “who”. My dad gave me a car. Мой папа дал мне машину. So, a подарок is a gift or a present. I bought mom a gift. Literally: I bought FOR Mom a gift. Right? We have to say “mam-yeh”. She was the recipient of the gift. And how would a woman say that, by the way? I bought for mom a present. Remember, we use Вы when addressing two or more people, even if they’re our friends. We were in a store. I bought mom a telephone. Lit: I bought for mom — or to mom — a telephone. She is the recipient. Whereas Vlad bought Tanya a present. А Влад купил Тане подарок. Ask: What did he buy? Say: He bought milk and pig fat. Он купил молоко и сало. He said Hi to me, and that’s all. He said to me hi…and that’s all. Он сказал мне “Привет”…..и всё. You bought Alina a cat? Again, remember, Alina is the recipient of the cat. She bought me a pen. Again, we’re using the “to me” form…that is, мне, because we are the recipient of the pen. He said that he wants coffee with milk. Он сказал что он хочет кофе с молоком. You wouldn’t happen to know where the subway is? Literally: You dont know where the metro is? We live in the center. That’s it for today’s podcast. Next time we’ll learn the sixth and final verb conjugation. Can you guess which one we’re missing? Keep practicing and I’ll see you next time! Hi Mark! Almost done with the 30 Episodes! On the “exercises only” section of Episode 28, around 4:08, You are asking in English to say in Russian, “who gave you a cat?”. But what follows that in Russian is asking “who gave you a car?”. I think you meant to ask the question “who gave you a car?” instead. Just letting you know.